Here is list of Best Free SketchUp Viewer For Windows. These software let you view SketchUp files on your desktop with various viewing options. A SketchUp file contains 3 dimensional models and diagrams designed in SketchUp. A SketchUp file (SKP file) can be created in SketchUp; however, you can open and view SKP files in various software that are not native to SKP files. 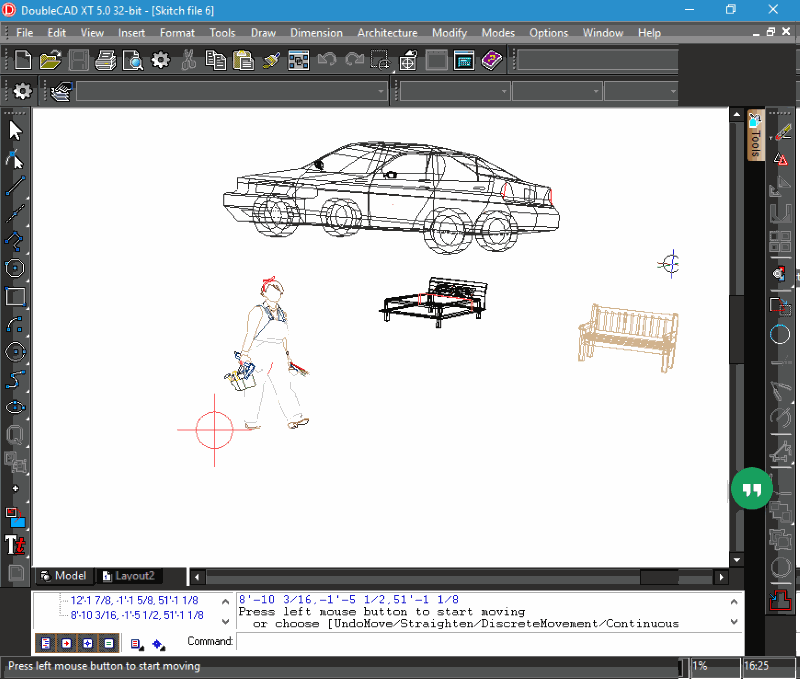 Most of these SKP viewer software let you view 3D objects from various directions, like: top, bottom, left, right, front, and back. You can even move objects freely in any direction to view them with ease. These also let you view SketchUp file in different modes, like you can view an object without edges, with wire frames, with outer edges, as solid, etc. Zoom feature is the most important one, and is present in most of the listed software. One of the listed software is a CAD editor and lets you edit and add new 3D details to an existing SketchUp file, but cannot save a SketchUp file in the same format. Go through this list of best free SketchUp Viewers to know more about them. You will also find out how to view SketUp files on Windows with these freeware. SketchUp Viewer is the free software that SketchUp provides to exclusively view SketchUp files. SKP files belong to SketchUp, thus provides almost all viewing options necessary to view a SketchUp file in a detailed manner. The Shadow option available in this software is worth noticing, as it renders shadows for objects depending on sun position and month of the year; these parameters can be adjusted manually. You can also checkout the list of best free CAD Viewer Software, DWF Viewer Software, and DXF Viewer Software. 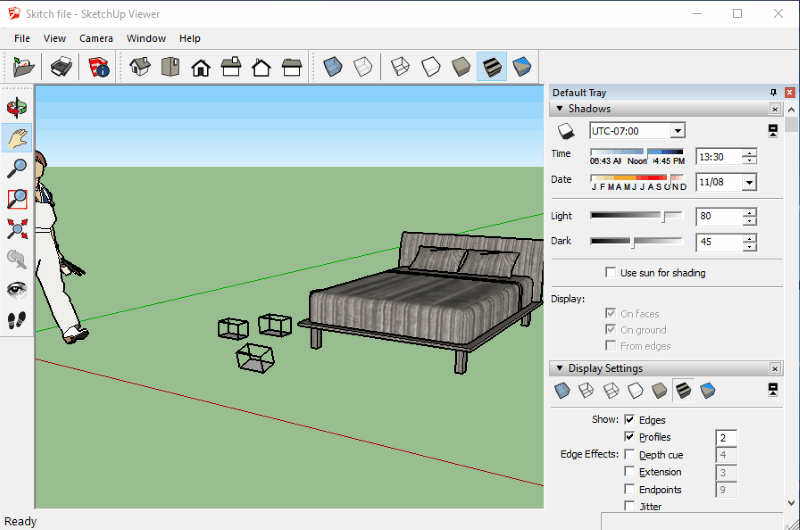 SketchUp Viewer is a free software to view SKP files, and is provided by the SketchUp team. It is specially designed to view 3D models created in SketchUp. Its main highlight is the Shadows option, which lets you view 3D objects with different shadow profiles based on time, position of sun, and climate. You can manually set parameters to render shadow for an object. This can be done by setting time, date, light, and darkness. You can also add Sun for shading if you want. Its loaded with various viewing options, which let you view a 3D model from left, right, top, bottom, front, and back sides. Various viewing modes let you view Sketchup file with Xray, Back edges, Wireframe, Hidden lines, Shades, Shaded with texture, and Monochrome. Use the dynamic zoom and rotate tools for a better look at loaded models. A model can be looked around in different camera views, such as: Orbit, Axis, Drag in any direction, and Look around. Advanced display tools are available for you to view SketchUp file as you like. You can choose if you want to view the Edges of a model. Set parameters to apply edge effects, depth cue, extensions, end points, and jitter. 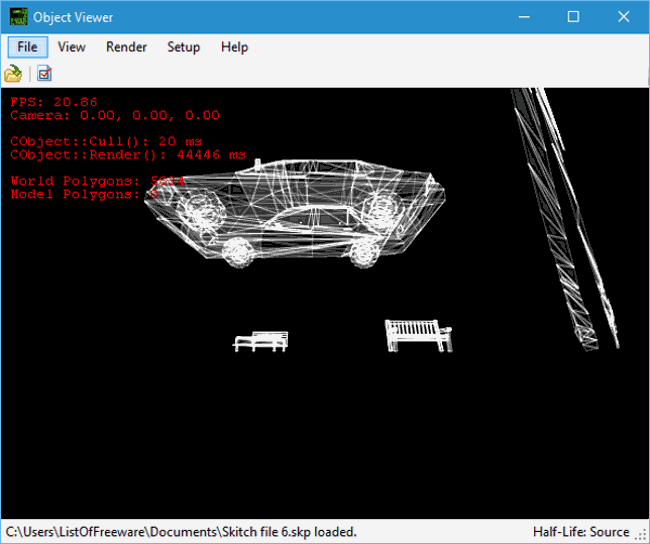 Crafty is 3D object viewer primarily developed for Half-Life modders for a quick preview of their work. As it opens various 3D objects, you can use it to view SketcUp files as well. Being a software to view game designs and mods, it has options to open files as world and models. Load a SKP file to view it in this software. Drag the loaded object around to view it from any side. You can also render various effects to your object if you want; these effects are: Texture view, Solid, X-ray, Wireframe, Point, and Overlay. The effects mentioned above can be applied to world map as well. This Sketchup viewer supports various 3D model formats that can be opened here: .skp, .mdl, .gl, .map, .boj, .prt, .pts, .rmf, .bsp, and .vmf. There are on board browsers to select materials and objects from directories. A map or object can be exported in the following formats with/without applying effects: .obj, .ent, .map, and .vmf. DoubleCAD XT is a free CAD software which can used to open various 3D drawing formats, including SketchUp files. Being a CAD software it has various tools available to help you edit 3D models or create a new model from scratch, but we are not going to focus on that. Lets know more about the viewing options that can help you view SketchUp files. You can view an object in isometric view and have a look from its left, right, top, bottom, front and back sides. You can also zoom an object for detailed view. Layers can be hidden selectively to view the wanted details. View just the edges or view an object as solid. If you want to view skp file and also want to apply some more details to it, then this the software you should go with. The editing tools available are extensive an help a lot with detailed 3D designing. Along with SKP, you can open 2CD DoubleCad Windows drawing file, 2CT DoubleCAD template, CGM Computer graphics meta file, DWG,DXF, PLT, Sand WMF files. Modified files can be saved as 2CD, 2CT, DWG, DXF, PLT, and WMF files. XnView is a cross platform viewer software, where you can open and view numerous file formats, including SKP files. It can load and open SketchUp file to view it, but it renders it as an image and not as an object. The 3D objects available here can be viewed but cannot be moved or rotated. There is not much that you can do here if you are looking to play around with the 3D objects. A SKP file can only be seen as it is. If you want to edit SketchUp file here, only regular image editing options are available, such as filters, enhancements, adjustments, etc. Resize, Text, Watermark, Crop, Black and White, etc. tools are available as well. But I don’t think these tools are of much use if you are working with a 3D file. Including 3D drawing files, such as SKP, you can also open vector images, bitmap images, videos, and audio files here. You can export SketchUp as JPG, GIF, PNG, TIFF, BMP, etc. This software is available for free only for non commercial purposes. You will have to buy a license if you want to use it commercially. AnyCAD SkpViewer may be the simplest SKP viewer available for Windows. The only thing that you can do here after opening a SketchUp file is view it from different sides. There is no Zoom or any other feature available that can give you a closer view of a model. Drag the loaded model to rotate is freely in any direction. Its an exclusive SketchUp viewer, and you cannot open or view any other file here.